David is privileged to work with some of the finest, coloured gemstones in the world. Over three decades he has established exclusive working relationships with his stonecutters. 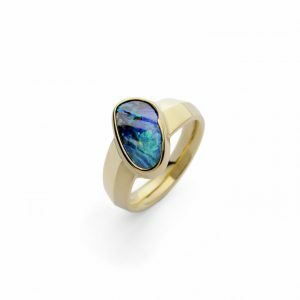 They travel to mines across the world to source raw materials: tourmalines are sourced from Africa, South America and Asia; one of David’s favourite gemstones, the Oregon sunstone, is mined in incredibly tough conditions in the harsh Oregon desert. 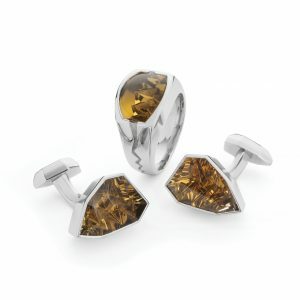 David’s gemstones are difficult to find, often requiring tonnes of rough material to be explored to find one outstanding crystal. It is David’s special working relationship with his cutter that provides him with the opportunity to work with some of the finest material from across the world. 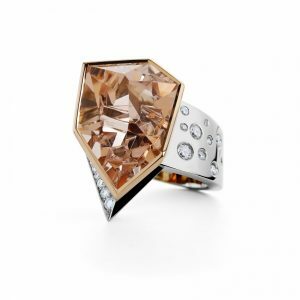 The innovation and artistry of the cutter provides the perfect canvas for David to transform these artisan cut gemstones into exquisite, elegant jewellery. David’s current collections include: Affinity, the finest coloured gemstones showcased in women’s jewellery; Opals, demonstrating the colour and beauty of Australian Boulder Opals; Menswear, demonstrating the unique way David designs bespoke jewellery for the discerning gentleman; Limited Edition, highlighting David’s talent for creating simple, yet exquisite, pieces of jewellery. "I fondly recall the moment we walked into David's gallery on our 20th wedding anniversary, and for the first time I saw 'the' ring. A sumptuous lemon Beryl, set in white gold, flanked by princess cut diamonds. Just like a fairytale, the ring was a perfect fit: from the first moment I tried it on, I knew it was meant to be. I adore my ring, just as much as my husband!"